Humans aren’t the only ones that can catch a cold. Your dog can also feel under the weather, especially when it’s colder outside. Now, we’re taking a closer look at what may cause your dog to catch a cold, and what sort of things you can do to help your pup when they’re sick. During the winter, people and dogs are cooped up inside more often. Time is largely spent inside with windows and doors shut tight, which makes it more likely that a cold virus is transferred. Whether your dog catches if from another pet or from a day spent at a dog park, it’s important to know that your dog’s symptoms are similar to your own. Dogs suffer from a different type of virus from the one that humans suffer from. In addition, the flu virus for dogs is not communicable between species, which means that you can’t get your dog sick and vice versa. However, there are some things that you’ll want to do to help your pup out when he or she is sick. What are Dog Cold Symptoms? Some symptoms that your dog may have include a runny or stuffed up nose, watery eyes, sneezing, and coughing. Your dog may also be more lethargic and may not eat as much as usual. With that said, it’s very important to distinguish cold symptoms from other illnesses, which may be more severe. If in doubt, always check with your veterinarian. Other, more-serious viruses or diseases include kennel cough, the influenza virus, allergies, or parasites. These can all causing coughing or sneezing as symptoms, and can progress to be something more serious if you don’t contact your veterinarian. 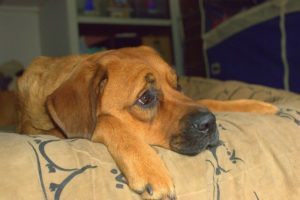 If your dog has a cold rather than something more serious, then there are few things you can do to help your dog feel better as he recovers. Use a common vaporizer in the room where your dog sleeps, or run a hot shower or bath to create steam. Just like with humans, dogs can have their nasal passages cleared slightly by steam. In addition, you’ll want to be sure your dog drinks fluids and eats, and also gets enough sleep. Reduce the amount of walks your pup takes, and allow him to recover. If you’re looking for more information about dogs, then be sure to check out the rest of our blog.